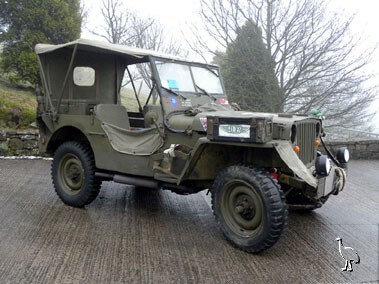 The immortal Willys Jeep is sometimes described as the vehicle that won WW2, mobilising the allied forces with lightweight, manoeuvrable transport. With its tough and torquey 2.2-litre (134cu in) sidevalve 'Go-Devil' motor coupled to four-wheel drive, it could go almost anywhere. In wartime Willys produced more than 360,000 MB Jeeps and Ford almost 280,000 identical GPWs. Helped by the French manufacturer Hotchkiss making another 28,000 M-201s between 1955 and 1966, the MB type remained in service around the world until well into the '70s, and since all the parts were interchangeable, it is common to find a mix of manufacture in the same vehicle. The vendor has owned this Jeep, from the first year of production, almost since he was old enough to drive some 49 years ago! More recently it has been campaigned very successfully in classic car rallies mostly in the UK but excursions were made to Ireland and other European countries. It has been rare for it not to collect an award, notable successes include two Gold and one Silver medals on Le Jog, famously known as the toughest UK rally if not the toughest European event for classic cars. This is a Willys variant, currently painted in the insignia of the 10th Battalion and all the paint detailing is correct, but it does carry some Ford parts which is quite common. The vendor describes this Jeep as "very good" in respects of the engine, transmission, body and interior, and "better than new" on the electrics, adding: "All mechanical parts have been overhauled to minimal tolerances and the engine has been assembled to exacting competition standards". He also informs us that "provision has been made for a Halda distance measuring device which is available by separate negotiation if required".